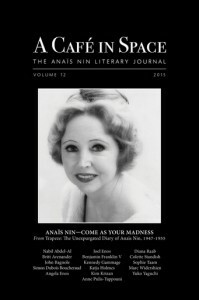 I’m really happy to let you know that A Café in Space: The Anaïs Nin Literary Journal is on Kindle (http://www.amazon.com/Cafe-Space-Anais-Literary-Journal-ebook/dp/B00T18RQXG/ref=sr_1_1?ie=UTF8&qid=1423586832&sr=8-1&keywords=cafe+in+space+12 ), and the print version can be now be pre-ordered (www.skybluepress.org ). Volume 12 includes a translated chapter of my biography in English as well as the review of my book by Britt Arenander. Volume 12 is filled with previously unpublished material from Anaïs Nin’s diary and correspondence as well as never-before-seen photos. Articles are by Kim Krizan, Benjamin Franklin V, John Bagnole, Nabil Abdel-Al, Joel and Angela Enos, Yuko Yaguchi, Simon Dubois Boucheraud, Sophie Taam, Katja Holmes, Anne Pulis-Tappouni, and yours truly. There is poetry from Kennedy Gammage and Marc Widershien and artwork by Colette Standish. Book reviews are of a new Henry Miller biography and John Tytell’s new book on the Beats. Topics include the famous “come as your madness” party, Nin’s political views, the strange odyssey of publishing A Spy in the House of Love, abortion as symbolism, Ladders to Fire, the Mediterranean, artists and models, Nin as a young woman in Paris, and the humor of the Durrell brothers. Cet article a été publié dans Edition, Texts. Mots clés : Anaïs Nin, biography, Henry Miller.